Power Lunch: Are You Prepared for a Recall? Home / Articles / 2011 / Food Processors: Are You Prepared for a Recall? Food Processors: Are You Prepared for a Recall? Tips from a food processor who went through one. Food recalls are not a question of if, but when, according to Doug Renfro, president of Renfro Foods. Even a company that does everything right may need to initiate a recall -- for example, because an upstream supplier recalled an ingredient. Establish a relationship with legal counsel (before a problem occurs) which can help prevent and resolve a variety of recall-related problems. That's what happened to Renfro Foods a Fort Worth, Texas, maker of gourmet salsas. The company survived a recall because it planned ahead. Companies that do not prepare for a recall are like people who buy burglar alarms after they have been robbed. Developing a recall risk management plan can reduce the risk of a recall, allow you to conduct them more effectively, and increase profitability. Renfro Foods always focused on food safety, and technology to meet this need has advanced over time. Two decades ago, Renfro kept production temperature and pH readings on paper records. Now, it uses software that automatically records many parameters to maintain consistent quality, and safety systems include in-line metal detection equipment to prevent physical contamination. Renfro's management practices also help prevent food safety problems that could lead to recalls. Employees use standard operating procedures and periodically undergo safety training. The Quality Assurance director reports to the company president, not the production supervisor, to avoid even a potential for conflict between priorities of food safety and maintaining high production volume. Low employee turnover increases institutional memory and reduces mistakes. Renfro also developed plans to respond to recalls quickly and effectively. It conducted mock recalls in-house. It used AccountMate and Tamlin Software Developer's Food Manufacturing Conductor program to quickly trace lots of ingredient deliveries up to suppliers and finished product shipments down to customers. This investment increased company profitability, because management personnel could immediately analyze a wealth of product data to maintain consistent quality and resolve potential problems. Steven Kronenberg is an attorney with Murphy, Pearson, Bradley & Feeney (415-788-1900, skronenberg@mpbf.com ) who offers outside general counsel services for the food processing, grocery, and restaurant industries. He is also the author of foodlawblog.com. Doug Renfro is president of Renfro Foods (www.renfrofoods.com). The recall occurred at the worst possible time, just a week before the Super Bowl. One of Renfro's largest customers is a retail foodservice "chicken wing specialist," and game weekend is the highest sales period of the year. Doug Renfro was also out of town attending a trade show, which impeded in-person communications with company personnel. Most critically, in the weeks between receiving the ingredient and the recall notice, Renfro Foods had used 90 percent of it in products that were already shipped to customers – normally, a good sign of a successful sales period. Renfro's recall risk management plan facilitated the company's fast and effective response. Software allowed it to quickly trace all relevant product shipments, and its specificity ensured only recalled product was targeted for destruction (avoiding what could have been a seven-figure loss if a recall was required for all product lots). Company personnel followed well-practiced procedures to communicate with distributors and retailers so the recalled product could be quickly located and held from sale, protecting consumers. Legal counsel helped safeguard the company's interests, especially in expediting reimbursement of the substantial documented expenses in conducting the recall, like the five-figure bills for recall response teams some stores hired to pull products from their shelves. Some companies have difficulty getting excited about a theoretical recall, but it's only theoretical until it happens to you. Developing a recall risk management plan can reduce this risk and help your company respond to recalls quickly and effectively. Teaching your employees how to follow these written plans, and documenting their compliance with standard procedures, can also help prepare for the unexpected, like responding to social network discussions about a recalled product. Establishing a relationship with legal counsel (before a problem occurs) helps prevent and resolve a variety of recall-related problems. Investing in recall prevention is also good business. Recalled products are unsold products, so avoiding a recall increases sales. Some stores' policies prohibit selling a product for a year after it has been recalled, just to be extra safe. 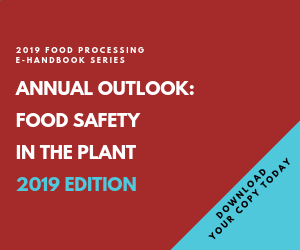 Making food safety your first priority can help minimize the risk of recalls, conduct them more effectively when necessary, and maximize sales of safe products. Manufacturing Software: How Well Do you Know Your System? Food processors expect more from manufacturing software, and they are getting it. Separate technologies provide unique powers not found in metal detectors. There are reasons why giving FDA recall powers may not have a positive impact on food safety.